The original foundation of the Surviving Sepsis Campaign was the Rivers trial on early goal-directed therapy. This is basically the NINDS trial of the critical care world: a study with ~300 patients showing implausibly positive results, published in NEJM, and rapidly brainwashing an entire discipline. The NINDS and Rivers trials became dogma not because they were rigorous, but rather because people wanted to believe them. After struggling for decades to treat stroke and sepsis, these finally represented some hope. The unfortunate reality is that the Rivers trial was a flimsy study. It was a single-center study with dodgy methodology, including mysterious disappearance of 25 patients who were randomized but never analyzed. Dr. Rivers had major conflicts of interest, including patenting a catheter to monitor svcO2. The Rivers trial and the Surviving Sepsis Campaign popularized sepsis protocols, which saved lives. Massive accomplishment. However, that doesn't validate the individual components of early goal-directed therapy. Any protocol involving early identification and intensive care of septic patients probably would have worked. Over time, nearly every component of early goal-directed therapy was disproven. Transfusing patients to a hemoglobin of 10 mg/dL is now recognized to be foolish. Central venous pressure predicts fluid responsiveness about as well as flipping a coin (Marik 2008). Monitoring the svcO2 saturation has been proven to be unnecessary. Massive fluid resuscitation encouraged by the protocol is increasingly recognized to be harmful (in the initial Rivers study, protocoled patients received an average of 13.4 liters!). The only core component that has survived the test of time is maintaining a mean arterial pressure above 65mm. Although the components of the Rivers protocol have been disproven, it remains blasphemous to admit that the Rivers trial was wrong. The Rivers trial is the underpinning of a decade of research in sepsis. If the Rivers trial isn't valid, then many studies based on it aren't valid either. Admitting Rivers is wrong is like admitting that the foundation of our house has rotted and is about to collapse. The Surviving Sepsis Campaign was founded on the basis of early goal-directed therapy. As this was disproven, the campaign stubbornly clung to it (for example, continuing to recommend CVP monitoring in 2014). The current guidelines have finally removed early goal-directed therapy, since to do otherwise would have rendered them irredeemably obsolete. However, many vestiges of early goal-directed therapy remain in the current guidelines (e.g. serial lactate measurement). We must take a hard, objective look at such therapies to determine if they still stand up, now that early goal-directed therapy has collapsed. 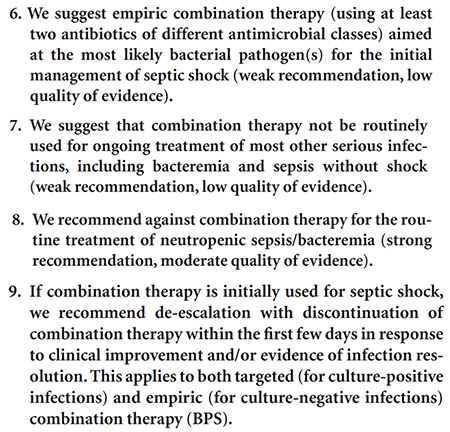 Myth #6: Combination therapy is beneficial for gram-negative septic shock. Combination therapy is defined as using two drugs against gram-negative pathogens, with a goal of synergy (box above). This has been proven to be ineffective in numerous RCTs and meta-analyses (example below). It remains controversial whether to initially provide double-coverage for gram-negative pathogens. However, even advocates of double-coverage generally admit that combination therapy doesn't work (the main argument for double-coverage is to increase the likelihood that at least one drug covers the pathogen). 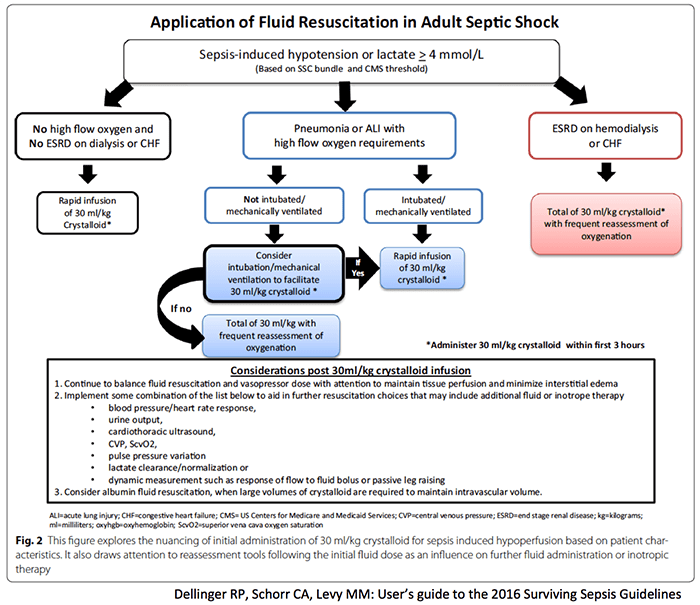 The guidelines attempt to draw a sharp distinction between septic shock and sepsis. This isn't possible, because definitions have shifted over time and many studies of antibiotics contain a mixture of both conditions. 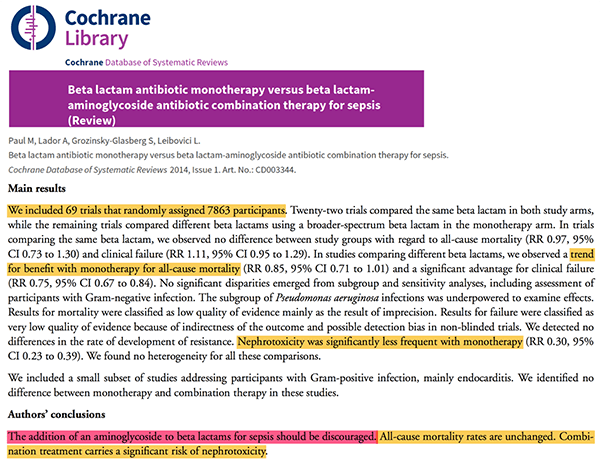 Regardless, there is no high-quality evidence to support combination therapy for gram-negatives in either sepsis or septic shock (1). 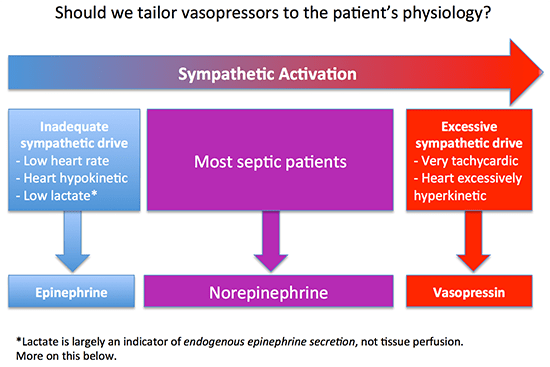 Myth #5: Norepinephrine is the best vasopressor for all septic patients. Norepinephrine is a great drug for septic shock. Everyone likes norepinephrine. However, this consensus is threatening to create a dogma that norepinephrine is the best drug for every patient. One prospective RCT and a subsequent meta-analysis show equivalent outcomes comparing epinephrine vs. norepinephrine (Myburgh 2008, Avni 2015). Recent publication of the VANISH and VANCS trials support the use of vasopressin as a front-line vasopressor in patients with sepsis. Myth #4: If one vasopressor doesn't work, additional drugs should be added in a sequential fashion. The guidelines recommend the strategy above for titrating vasopressors. This algorithm ignores individual differences in hemodynamics and vasopressor responsiveness. For example, rapidly up- and down-titrating vasopressors may reveal how a patient responds to different drugs. This is safe and easy: make a change, observe, if it doesn't help then return to your prior regimen. Vasopressor challenge may be useful to select agents that work, while avoiding agents that aren't helping. 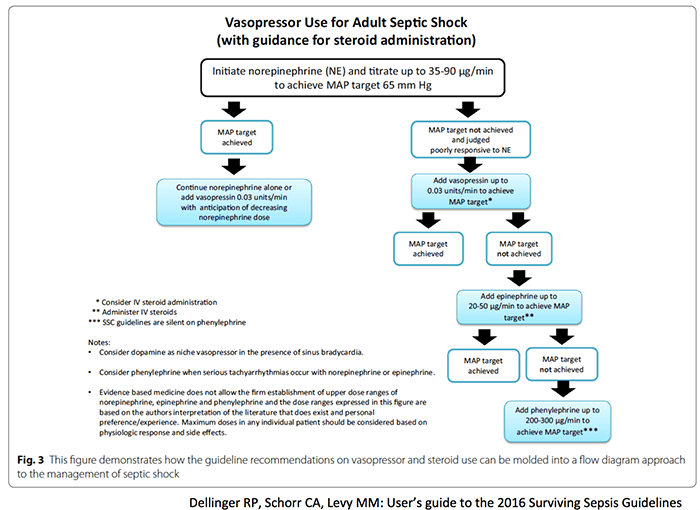 One problem with the strategy recommended in the guidelines is that patients often wind up on high-dose norepinephrine plus vasopressin. This combination provides a lot of afterload, which may drop cardiac output in patients with cardiomyopathy (yes, that's right: vasopressor-induced shock). Such patients often respond nicely to up-titration of epinephrine with simultaneous down-titration of norepinephrine. Myth #3: Lactate is a measure of tissue perfusion. 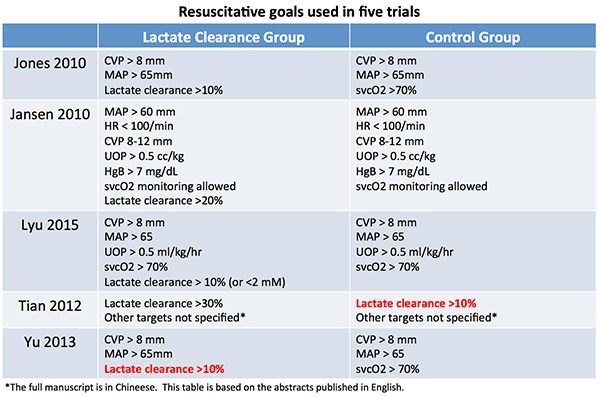 Normalization of lactate should be used as a resuscitation target. It remains widely believed that lactate is a measurement of perfusion, systemic oxygenation, and anaerobic metabolism. This is a myth. Among septic patients, the primary cause of lactate elevation is beta-2 agonist stimulation (from endogenous and exogenous epinephrine). Beta-2 agonist stimulation causes the liver to secrete lactate via an aerobic mechanism. Lactate may be used by the heart and brain as a metabolic fuel, suggesting that this is an adaptive mechanism designed to handle physiologic stress. First, let's imagine a young woman who is doing great, after receiving some fluids and norepinephrine. Her blood pressure, urine output, and skin perfusion are excellent. Her lactate is 6 mM, revealing the presence of endogenous epinephrine. Giving her additional norepinephrine and dobutamine can overdrive suppress her sympathetic nervous system, shutting down endogenous epinephrine production. This will reduce lactate, but it probably won't help her. It's basically using exogenous norepinephrine and dobutamine to replace her endogenous epinephrine (which was working perfectly well). Second, let's imagine an elderly man who is doing poorly despite receiving fluids and norepinephrine. His heart rate is in the 70s, his urine output is poor, and his extremities are mottled. His lactate is 0.5 mM. This patient is suffering from an inadequate sympathetic response, with a deficiency of endogenous epinephrine. After an epinephrine infusion is started, he improves dramatically with excellent urine output and skin perfusion. However, the exogenous epinephrine causes his lactate to increase to 6 mM. This increase in lactate is actually a positive prognostic sign, indicating that he is likely to improve (Wutrich 2010). Rising lactate doesn't mean that he's getting sicker – it means that the epinephrine is working (2). Jones 2010: This showed that chasing lactate was equivalent to chasing svcO2. However, recent studies suggest that chasing svcO2 isn't helpful… so chasing lactate and chasing svcO2 may be equally ineffective. Jansen 2010: This prospective RCT found no mortality benefit among patients whose lactate levels were measured. However, a post-hoc adjusted analysis did find benefit. The remaining three studies aren't available in English (Lyu 2015, Tian 2012, Yu 2013). However, these studies are horrifically heterogeneous. For example, Tian 2012 used lactate clearance >10% in the control group, whereas Yu 2013 used this same goal in the experimental group (table below, red text). It's simply not valid to combine such heterogeneous studies into a meta-analysis. Ultimately, the available evidence is limited (3). However, it is doubtful that trying to “normalize” the lactate is beneficial. 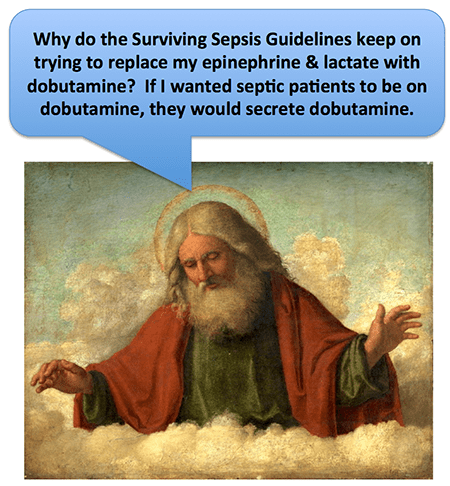 Septic patients probably aren't supposed to have a “normal” lactate (an example of inappropriate euboxia). Myth #2: All septic patients must receive 30 ml/kg fluid initially. I recently cared for a patient nearly killed by this concept. A morbidly obese young woman presented to an outside hospital with influenza pneumonia. She met qSOFA criteria due to tachypnea and a blood pressure of 95/60 (her baseline). To comply with CMS regulations, the hospital recently implemented a sepsis order set including 30 cc/kg fluid. The trigger was pulled. Following a single keystroke, she received nearly four liters of saline (dosed per actual weight) plus several IV bags of antibiotics. That pushed her into full-blown ARDS, precipitating a one-week stint on the ventilator while we diuresed her. Let's be honest: nobody really knows the right amount of fluid to give to a patient with sepsis. 30 cc/kg is a reasonable dose for most patients. However, the concept that every patient must receive 30 cc/kg fluid is nuts. For example, septic shock does sometimes coexist with hypervolemia in patients with CHF or pulmonary hypertension (an example of Hickam's Dictum, above). We must always consider the entire patient to answer the key question: what physiologic process represents this patient's greatest life-threat? For many patients with ARDS and mild hypotension/hyperlactatemia, their primary life-threat is ARDS. In that case, the risk of large-volume resuscitation outweighs the possible benefit. Intubation, sedation, and positive-pressure ventilation typically cause patients to become more hemodynamically unstable. In many cases, the amount of hemodynamic instability caused by intubation and sedation will outweigh any hemodynamic benefit from 30 cc/kg fluid. There is no evidence to support the practice of pre-emptive intubation to facilitate fluid loading in the context of ARDS. If anything, evidence might suggest the opposite: diuresis to facilitate extubation (FACTT trial). Myth #1: It's helpful to mandate that specific sepsis therapies be given within a rigid time frame. It is widely believed that early antibiotics are essential, with each hour being critical. This is based on retrospective studies which correlate the delay to antibiotics with outcome. However, delay to antibiotics also correlates with numerous confounders (atypical clinical presentation, mental status alteration, day of the week, time of day, delay to other treatments, etc.). These correlational studies should be used only for hypothesis generation. To make matters even muddier, studies disagree. A meta-analysis detected no benefit from early antibiotics (Sterling 2015). Ultimately, there is no scientific answer to this question (5). However, let's suppose that earlier antibiotics do help (probably true). The next question is whether it is beneficial for guidelines to mandate that antibiotics be given within a certain time-frame. This may accelerate care, but it may also force practitioners to cut corners. On the balance, is this helpful? What is better: fast and sloppy care, or slow and accurate care? This, too, is unknown. A cautionary tale is provided by the case of antibiotics in pneumonia. Retrospective studies in 1997 and 2004 suggested a correlation between reduced mortality and antibiotics administration within four hours. Subsequently, numerous regulatory bodies adopted this as a quality benchmark. Over the following years, it was shown that this benchmark increased misdiagnosis and inappropriate antibiotic use. Finally, the four-hour benchmark was abandoned. We have a history of over-estimating our knowledge of sepsis and the benefit of our interventions. Acknowledging uncertainty is uncomfortable, but it may ultimately make us more thoughtful and flexible clinicians. Intentional double-coverage of gram-negative bacilli to achieve synergy has no proven benefit. Norepinephrine is a good vasopressor, but it is unclear whether it is the best drug for every patient. The ideal drug selection and dose is unknown. Lactic acid is not a reliable measurement of tissue perfusion. It is doubtful that using lactate as a resuscitation endpoint is beneficial. Nobody knows how much fluid should be given to septic patients or how quickly it should be given. The benefit of early therapy is unproven. Insufficient evidence exists to make any concrete recommendation regarding the timing of interventions. Combination therapy is evidence-based for management of severe pneumonia (azithromycin + beta-lactam) and toxic shock syndrome (clindamycin + beta-lactam). However, the use of combination therapy for gram negatives isn't. I've seen this many times, and it's generally a beautiful phenomenon. The lactate spikes in response to epinephrine, and often patients improve a lot and come off vasopressors entirely within the next 24 hours. The most meaningful question is whether trending lactate would be beneficial after we stop measuring CVP. None of these trials answer that question (all were performed in the bygone era of early goal-directed therapy). The disease previously known as ALI (Acute Lung Injury) has now been re-defined as ARDS. It would be nearly impossible to design a RCT to test this, using time as an independent variable. maybe, the best PULMcrit ever!! Excellent perspective on a difficult problem, in which the push to meet quality metrics far outpaces our knowledge needed to answer important questions. Provides more questions than answers. If you’re not interested in rocking the boat, you’re reading the wrong blog. Unfortunately when Rivers’ study had more than 250 included in the statistically analysis (which it did) is was no longer statistically signficant. Fortunately, the research coordinator that left his positition was courageous enough to inform those including at the NIH of this “doctored data.” Rivers’ tried to control the stream in his own river. Nothing to be proud of and dangerous to the rest of the field. Yes, there is a “way to skirt the rule”. CMS says you must give the 30 cc/kg bolus, HOWEVER, there is no specified time frame over which you must give the bolus as long as it’s greater than 125 cc/hr?!. I found this important caveat as I am the sepsis monkey at my hospital and have tried to make sense of all of this…I can’t, but I am in the trenches trying to help my patients and I spent a lot of time researching. So here it goes said another way. CMS requires the fluids for any and all patients, yes, even with CHF or ESRD!! But, as long as you give the fluid at a rate greater than 125 cc/hr, it counts!! Isn’t that insane?! Don’t believe me? Here it is in the CMS document. I have never seen any website state this fact, I found it myself and have been using it at our hospital system to “comply” with the requirement but not overload our patients. Hope it helps you Brandon. http://www.qualityreportingcenter.com/wp-content/uploads/2015/12/IQR-Sepsis-20150921-QA-Transcript_vFINAL508.pdf Go to page 3 and 4 of 76… I’ve pulled some of the text for you… I’ll post it in a bit. i thought the 30/kg had to be given in the first 3 hours? NO? CMS requires the fluids for any and all patients, yes, even with CHF or ESRD!! But, as long as you give the fluid at a rate greater than 125 cc/hr, it counts!! Isn’t that insane?! Don’t believe me? Here it is in the CMS document. I have never seen any website state this fact, I found it myself and have been using it at our hospital system to “comply” with the requirement without overloading our patients. Hope it helps you Brandon. Go to page 3 and 4 of 76… I’ve pulled some of the text for you…will post after this. Excellent job here Josh. Always best to have “strong recommendations” based on “weak evidence” challenged by deliberate and thoughtful dissent. I especially like the attack on the absolute 30 cc/kg rule and absolute preference to norepinephrine, but are you sure you didn’t go after lactate as a surrogate just to make six myths out of five? We all watch it with anticipation for a reason. In a plea to all the people complaining about absolute CMS metrics, I urge them to voice their concerns and arguments to Sean Townsend at TownseSR@sutterhealth.org. He is often promptly responsive to rational and collegial feedback, and he needs to hear your arguments. Thanks, Gil. Let me clarify my thoughts on lactate a bit. (1) Lactate is great for identifying sick patients with sepsis (solid evidence, I don’t think anyone argues that). (2) Cycling lactate in patients not receiving epinephrine can provide some sense of the direction of resuscitation. When the lactate goes down this is reassuring. If the lactate doesn’t go down, this is a signal to globally re-consider the patient (look for additional foci of infection, echo the patient, re-consider antibiotic choices, look at urine output, look at skin perfusion, etc.). (3) I will sometimes cycle lactate in sepsis patients who are receiving epinephrine infusions. In these patients, the lactate usually increases due to the epinephrine. If the lactate goes too high (e.g. >10 mM), then consideration should be given to down-titrate the epinephrine. My main concern with lactate is that it tends to trigger a knee-jerk response to give the patient more fluid or dobutamine. So the problem may not lie with the test necessarily, but rather our use of it. Thanks Josh, great post. My first comment. For a couple years now we have been teaching our aeromedical crew at STARS that lactate is not just about anaerobic metabolism and a significant portion of its level is likely from B2 stimulation via endogenous catecholamines. You seem to imply above that all the lactate is produced in this fashion. Could their not be some mitochondrial dysfunction in septic patients resulting in impaired ability to utilize oxygen and thus some component of anaerobic metabolism contributing to some of that lactate level? Again, great post, looking forward to your reply. yep, CMS and other “quality metrics” are continually lagging behind the current evidence. With regard to how much fluids, dynamic indices and PLR manuevers with ultrasound evaluation are becoming more popular. Michael Pinksky’s work shows that even volume overloaded pts may be fluid responsive however, he proposes measuring the mean systemic filling pressure I strongly urge you to do a PULMcrit on this. It can easily be done at the bedside with a bit of kowledge and patience. Terrific post. Your take on Myth #5 is the most elegant distillation of “vasopressor choices” that I’ve read, and really sums up my own (haphazard, less fully articulated) interpretation of the literature as well. Gonna use that one as a teaching tool! Additionally in point 6, your screen shot shows that they still recommend antimicrobial de-escalation (ADE) for both culture positive and negative infections. We recently showed that all the evidence on this was biased and that there is no proof that there is any beneficial effects of ADE on antimicrobial resistance as this has never been studied. ADE may actually cause an increase in the total duration of antimicrobial therapy and have an effect opposite to what is expected. Can I thumbs up this reply? Thanks. Great post. This needed to be said. And yes it’s better than nothing but it’s not gospel. According to CMS measures, are there ways we can get around giving a full 30cc/kg bolus if patients have lactate >4 or hypotension. If a patient is in acute CHF or ESRD with overload, do we still have to intubate/prepare to intubate and give the bolus, or can we write something in the chart to get around this? We can deviate from sepsis protocol for dnr/dni patients but any other way to skirt the rule of the land? This is exactly the sort of patronizing and dismissive attitude I’ve come to expect from university hospital doctors and other so-called “centers of excellence.” The arrogance and anger that are triggered whenever someone with a significant amount of clinical experience challenges their dogma is impressive, but does nothing for progress in medicine. Agree. Some people have defended the surviving sepsis guidelines by arguing essentially “well, they aren’t perfect, but they’re good for uninformed small community-hospital docs who don’t know any better.” I’ve never agreed with that concept. I would argue that the guidelines should make whatever recommendations are supported by good evidence (and nothing more). This will leave lots of gaps, which is OK. Then, physicians can be left to fill in the gaps based on their own experience, setting, and practice. From a nursing perspective, this was very interesting especially in relation to myth 2. I always found it insane that we have to give 30 cc/kg of fluids to a septic patient who is in heart failure, and now learning that the recommendation is based low-quality evidence, it seems even more insane to me. If the patient does truly need the full 30 mL/kg, it would make more sense to me to infuse it slowly and see how they tolerate it rather than infuse rapidly and diurese or intubate them. There are some interesting arguments for infusing fluid more slowly, rather than giving it as a bolus. https://www.ncbi.nlm.nih.gov/pmc/articles/PMC3396245/. Such a great post Josh! Re: #2, #4, #5: I have found no more powerful guide than Echo to help answer these questions for the patient in front of me. Then just a few quick follow-up views to assess response gives me a real sense of pathophysiologic evolution. Completely agree. My main strategy for trying to understand hemodynamics is echocardiograph and challenging the patient with various therapies (e.g. careful fluid challenge, vasopressor challenge, etc). We still must work towards consensus. It doesn’t mean that on individual basis clinical judgement should not be applied while decision making.I feel the post is too much out of context.Im not saying everything you saying is wrong but the post should have been mild rather labelling everything as a myth. It’s doubtful that any consensus on septic shock management will be reached during our lifetimes (if so, it would probably be a sign of the coming of the apocalypse). 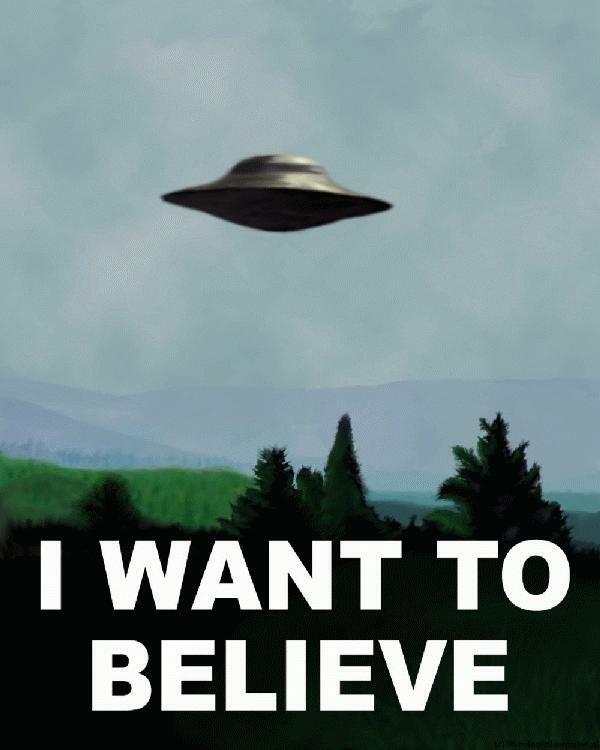 Scientific consensus has no bearing on fact. If the research upon which the recommendations were based is faulty or incomplete, then the label of, “Myth,” seems more than appropriate. My only comments are that you should be on the SSCG committee to shape the future guidelines. I believe this will be very important. I am an ICU nurse with experience working in academic centers and community hospitals. I enjoy your articles but I can relate to what Matthew describes. In my experience you don’t need a protocol at large referral centers because the patient is being swarmed by residents, fellows etc. At smaller facilities with limited resources a resus protocol can at least get things moving. Rather than a 250ml bolus or some other symbolic intervention- the sepsis protocol gives me some tools to work with: central line, fluids, norepi. At least it provides a minimum level of care. If you have a good doc working on the patient that’s great but it’s not always the case. Many things it’s a struggle to get people to pay attention. Also I think there is some utility for lactate at least as a screening tool. It’s harder for the hospitalist to ignore a patient in distress/shock when the lactate is elevated. Agree with using lactate as a screening tool to identify critically ill patients, absolutely. Sepsis protocols are better than nothing, but I would still argue that they shouldn’t be a replacement for attentive patient care. Sepsis has a mortality higher than STEMI, so if smaller hospitals aren’t able to provide enough attention to these patients then they should probably transfer them to a place that can. First, I’m not trying to malign Dr. Rivers. I’m not impugning his intentions, merely challenging the conclusions of his study. The PROCESS trial and other similar trials (ARISE, PROMISE) represent enormous advances in the study of septic shock, which have rightly had major effects on current sepsis therapy. The failure of these trials to find patients with low svcO2 suggests that Rivers cohort of patients may have represented an anomaly. Rivers is non-replicatable, and such studies cannot be accepted as scientific fact. Excelente post. Más datos para enfrentar este problema diario. How do you handle the CMS requirements regarding septic Shock and lactate over 4? We are told that there is no way out of giving 30cc/kg other than convincing the patient to refuse and documenting this. Just saying you are concerned with fluid overload is not adequate even if you start vasopressors early. Also giving fluid based on ideal or adjusted weight is not an out. So you have to treat every kg of fat with water. If I read the 2018 Core Measure update correctly they are INCREASING the number of patients who require 30 ml/kg. Rather than just people defined as “Septic Shock” it now appears that anyone with “initial hypotension” must get 30 ml/kg. I’m learning a lot from your blog, thanks for the fantastic post! I completely agree with your interpretation of the literature, and deeply disagree with turning little pieces of data into official policy, which at best impairs progress, and at worst kills patients. On the other hand, rather than trash the Rivers study, as a scientist, I prefer to see it as a stepping stone in our path towards truth. Though it has its faults, painting it as flimsy/shady and clouded by COI is misleading in itself, and minimizes the huge efforts made by Rivers and others to bring sepsis into the spotlight. Studies are difficult to do, and hindsight is 20/20. Agree, however part of being a scientist is also admitting when we are wrong, and when something has been disproven. From a scientific standpoint, recognizing that something is incorrect is enormously important (perhaps more important than discovering a new piece of information).